The exponential horn has an acoustic loading property that allows the speaker driver to remain evenly balanced in output level over its frequency range. The benefits of the design were first published by C.R. Hanna and J. Slepian in 1924 for the American Institute of Electrical Engineers (AIEE). 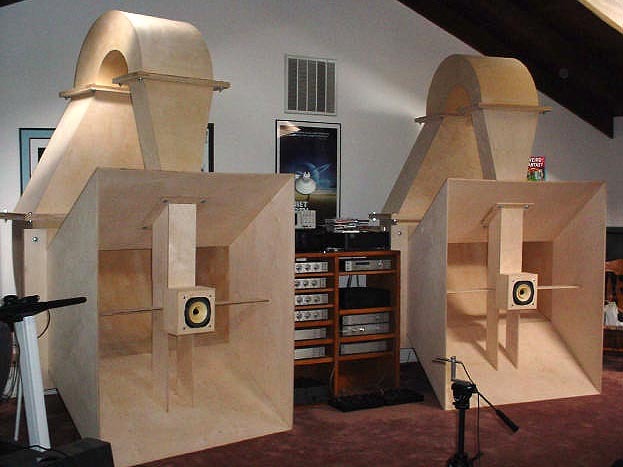 A major drawback is that the exponential horn allows for a narrowing of the radiation pattern as frequency increases, making for high frequency 'beaming' on axis and dull sound off axis. Another concern is that a throat of small diameter is needed for high efficiency at high frequencies but a larger throat is best for low frequencies. A common solution is to use two or more horns, each with the appropriate throat size, mouth size and flare rate for best performance in a selected frequency range, with sufficient overlap between the frequency ranges to provide a smooth transition between horns. Another solution tried in the late 1930s by Harry F. Olson of RCA was to use multiple exponential flare rates, either by connecting increasingly larger horns in series or by subdividing the interior of a single horn.